234 (30 Aug 1944), 235, 236, 239, 241, 243, 245, 246, 247, 248, 251, 253, 255, 256, 261, 262, 263, 265, 266, 269, 270, 271, 272(A), 276, 277, 275, 280, 281, 283, 285, 286, 287, 290 (24 Dec 1944). (A) Non-Credited aborted mission. For Mission dates, targets and Mission Reports, see Combat Missions. 1Lt Ralph C. McKinley (P) - First mission (234) flown as CoPilot with experienced combat Pilot, 1Lt John R. Helms. 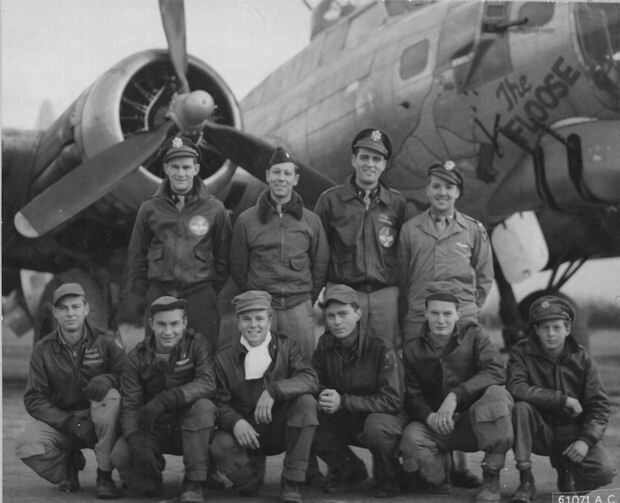 All other missions flown as First Pilot. Completed Combat tour (32 missions) on 24 Dec 1944 (mission 290). 1Lt George A. Green (B) - Flew on 9 credited combat missions with 1Lt McKinley (234, 235, 236, 239, 241, 243, 245, 246, 248) and 21 missions with other Pilots as a Lead Crew Bombardier (251, 253, 254, 255, 261, 263, 266, 271, 274, 283, 287, 292, 294, 299, 303, 311, 318, 326, 331, 339, 347). Completed 30 mission combat tour on 28 March 1945 (mission 347). Sgt Jack D. Cahn (WG) - Removed from crew when second Waist Gunner was deleted from 303rd BG(H) combat crews. Flew no 303rd BG(H) combat missions.